You have a few choices of transportation in Seoul. You can either take the subway, bus or taxi. If you join a group tour, you may travel in a rented car or coach / bus. But be warned, you would certainly walk on foot and climb stairs frequently when you are in Seoul....! The easiest way is taking the subway or bus. You can buy T-Money cards for 2500 Won and use it on all trains and most buses in Seoul and other districts. (It is a bit like Touch N Go card in Malaysia). You can buy the card from many Convenience stores or subway ticket booths. You can top up your card from 1000 Won to 90000 Won at the automatic recharging machine at the stations which also come with instruction in English. Usually, the fare will be cheaper by 100 Won with T-Money. If by the end of your trip your card still has money, you can get a refund from the Convenience shops up to 20000 Won but they will retain 500 Won. The 15 lines do look complicated but don’t worry, there are instructions and notices in English and the trains keep to the schedule almost to a T. It is rarely late so you have to be punctual. If you miss a train, the next one is probably only a few minutes away. Just make sure you are on the right platform, the right type of train and take the right exit to the place you want to go to. When you board the train, observe the social rules adhered by the local commuters. Stand aside and let the train commuters come out first. Do not sit on the seats reserved for elderly citizens, etc even if they are empty. You’ll get a stare if you dare sit on one! The commuters tend to stand facing the windows / the seats. I was amazed to see that they could stand without holding to any railing. Their hands were busy clicking on the smart phones while listening on their headphones. Seoul Station is the centre. The line goes around and outside Seoul. Incheon International Airport & Gimpo Airport – Seoul. ** KTX Express Line connects Seoul and Busan and the duration of the journey is less than 3 hours. There are special lanes for buses which other vehicles are not allowed to use. Bus stops come with schedules and even announcement! You will know which bus is approaching from the PA system. There is a rule to follow- you board using the front door but exit using the back door. Don’t forget to use T-Money on the bus. There are also special buses operated by Korea Tourism Organisation that you can board for free. These buses usually take you to other districts in Korea. Check their website and FB page (K-Travel Bus) for news and promotions. Taxis are metred but the fare can be quite expensive. There are a few types of taxi you can ride, depending on your budget and location. 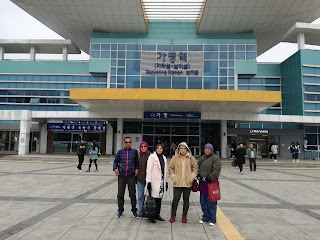 If you are going to Nami Island, you will board a train first to Gapyeong Station. From there, you will need to take a taxi to the Namiseom jetty. The ride is only 5 minutes and you pay around 4000 Won. Next Topic - Flights to Seoul, Busan and Jeju from Malaysia !